So, it seems that birds have been finding their way into my life lately, as evidenced here: I went in to one of my favorite shops yesterday and had to buy this little guy, who is now perched next to the flowers my husband designed and sent to me at the Arts Festival. I also had to have this plaque, which also features a bird. Imagine my surprise and delight when she package everything in this adorable bag! Even my own art is not immune. 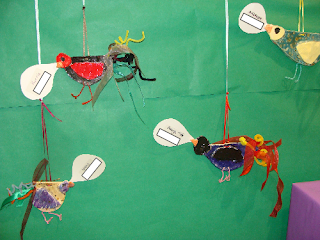 Then there is one of the hands-on activities from the Arts Festival, featuring, of course, birds. Some of the projects featured at the Arts Festival featured birds as well. 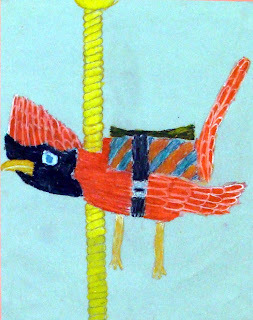 Fifth grade carousel animal done in oil pastel. 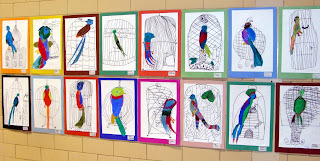 Third grade uncaged quetzal birds done in oil pastel and black marker. Student working on her quetzal. 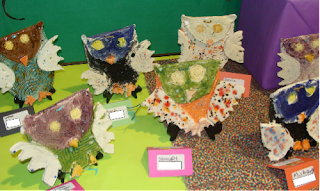 Clay owls made by first grade. You can find the directions here. So it only makes sense that I give away this little guy. I got the idea from a photo on Flikr and have come to find out that a similar idea was featured in Arts & Activities magazine. My student teacher, Kinsey, and I modified the bird to make it our own style. While I will be blogging instructions for these very soon, this is your opportunity to have one, in hand, so you can see all the details up close. In order to be chosen to receive this ceramic bird, all you have to do is leave me a comment giving me some feedback about my blog; something you have enjoyed, something you would like to see, something that really annoys you, etc. I will randomly choose the winner on Wednesday, March 30th. 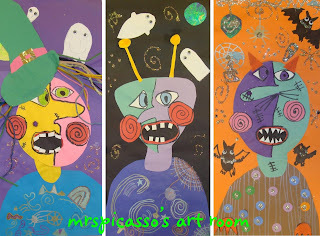 Good luck and thank you for following Mrs. Picasso's Art Room! Don't enter me for the prize, but you KNOW I love wild birds, right? Last year I stuffed a bowl with raffle tickets to get your bird painting and with your help, pretty much designed my living room around that piece. I hope you have another one at this year's fundraiser! I love love love everything you do on your blog AND all of your art! Great job on your arts festival! I too am finding birds entering my life more and more...in my art as well. I am currently beginning a unit on birds and have been loving the clay bird that you showed. I would love to have an example in hand. I've been popping into your blog and have been really impressed by your bulletin boards...so colorful and fun! Hi Denise, Love all the birds as well(looking forward to the directions for the cermanic cutie). You have some fantastic projects! I have saved many in my "to do folder": non objective art collage, metal repoussee masks, Kimmy Cantrell clay masks and musical mandalas (just to name a few). I love the step by step directions you post with many of your projects. Thanks for all your great ideas! I have enjoyed keeping up with your blog for some time now! Your projects are awesome, and I have tested several of them in my own art classroom. Recently I tried the clay owls with my 2nd graders and the winter shapes collage with my kinders, both with great results! Thanks for sharing! I absolutely love these ceramic birds. I may have to try this with my ceramic class. 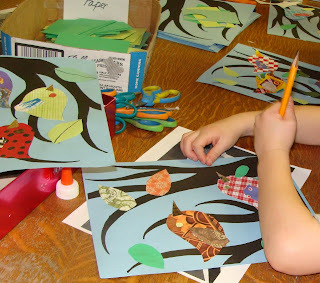 You have some great projects on your blog and I am excited to try the owls and possibly the bird with my students. You will have to check out my art blog as well...keep up the good work! Our job is the best, isn't it!